If you were one of the fans who were hoping that Manny Pacquiao would leave Top Rank when his contract expires with them at the end of 2014, you might not be happy to read the news from Top Rank promoter Bob Arum, who is saying that Pacquiao may re-sign with Top Rank to stay with them beyond 2015. This could mean a 2-year contract or possibly even longer. That’s interesting that Pacquiao would re-sign with Top Rank, because it means that he’ll likely be stuck fighting Brandon Rios, Mike Alvarado, Mikey Garcia, Ruslan Provodnikov and Timothy Bradley any given number of times in 2015-2016. Unless Arum can add some depth to his Top Rank stable, we could be seeing Pacquiao fight a lot of rematches with guys from Arum’s Top Rank stable. Ideally, it would be good to see Pacquiao being matched against guys outside of Top Rank in order to bring in some new blood, and to limit some of the retread opponents for him, but that’s kind of wishful thinking. If Pacquiao does re-sign with Top Rank for another 2-3 years, it pretty much means the end of any chances of Pacquiao ever fighting Mayweather or guys like Saul “Canelo” Alvarez, Danny Garcia, Amir Khan, Lucas Matthysse and Adrien Broner. Canelo, Garcia, Broner and Matthysse might have a chance to fight Pacquiao if their promoters at Golden Boy Promotions could work with Arum on making a fight against Pacquiao happen, but there’s probably not a good chance of that happening under the current situation with the two promotional companies not working with each other. 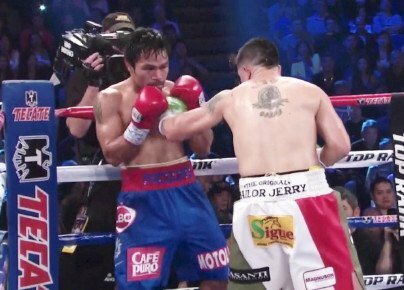 I think many boxing fans have no problems with watching Pacquiao fight guys like Alvarado, Rios, Provodnikov and Bradley once. But if Pacquiao ends up fighting them repeatedly, if for no other reason there’s no one new in the Top Rank stable for him to fight, then it becomes routine and dull. Fans want to see Pacquiao fight new guys and have more range of choices. It would be great if Arum could add more variety to his stable so that Pacquiao doesn’t get stuck with the same guys, because there’s no point in rematches with guys when the first fights were dull to watch. In looking at it as a positive, Pacquiao might be able to prolong his career if he stays with Top Rank, because if he’s mainly going to be fighting guys like Mike Alvarado, Brandon Rios, Ruslan Provodnikov, Mikey Garcia and Tim Bradley over and over, he’ll probably be better off than he would be if he had to fight guys that would have a good chance of beating him like Mayweather, Canelo, Danny Garcia and Keith Thurman.